The Boynton Beach Art District, the downtown area's up-and-coming alternative contemporary art scene, is home to a wide variety of working artists who occupy 11 industrial warehouse studios. This community of talented artists represents a diverse range of artistic mediums, including kinetic artists, graffiti & tattoo artists, metal sculptors, muralists, stone carvers, painters, performance artists, and musicians. This once crime laden area now brims with life and creativity, regularly sponsoring open mic nights, monthly art walks, exhibitions, and various special events. 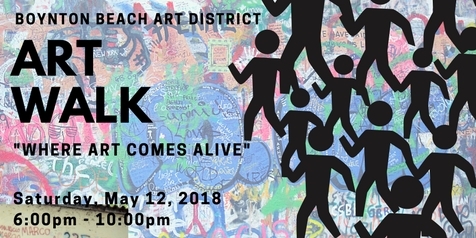 On Saturday, May 12, 2018, the Boynton Beach Art District will host its monthly Art Walk which serves not only to showcase the work of the resident artists within the Art District but also to help foster a sense of community and art appreciation in Downtown Boynton Beach. The Art Walk will feature live music, including open-jam performances, food trucks, and a diverse collection of vendors with art and unique items on display and available for purchase. The resident artists will also have their studios open to the public, offering visitors the unique opportunity to get a behind-the-scenes look into the Boynton Beach art scene as they meet the artists and tour their open galleries and creative workspaces. Consistent with its name and intended purpose, the Boynton Beach Art District's monthly Art Walk is an inspiring event "Where Art Comes Alive." The upcoming Art Walk, as always, is sure to be an incredible time for art enthusiasts and the general public alike. If you are curious about the thriving art scene in the Boynton Beach, be sure to come check it out and show your support for this family of creative people, who together are making a difference in the Downtown Boynton Beach community.